A geotextile is defined as any permeable textile material that is used with foundation, soil, rock, earth, etc to increase stability and decrease wind and water erosion. A geotextile may be made of synthetic or natural fibers. In contrast, a geomembrane is a continuous membrane-type liner or barrier Geomembranes must have sufficiently low permeability to control migration of fluid in a constructed project, structure or system. A geotextile is designed to be permeable to allow the flow of fluids through it or in it, and a geomembrane is designed to restrict the fluid flow. 2. 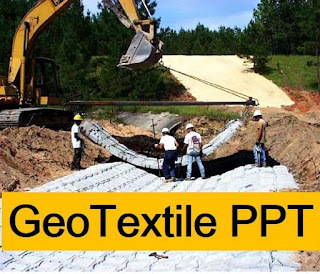 INTRODUCTION  Geotextiles are permeable fabrics which, when used in association with soil, have the ability to separate, filter, reinforce, protect, or drain.  Typically made from polypropylene or polyester, geotextile fabrics come in three basic forms: • woven (looks like mail bag sacking) • needle punched (looks like felt) • heat bonded (looks like ironed felt). 4. FILTRATION The equilibrium geotextile to soil system that allows for adequate liquid flow with limited soil loss across the plane of geotextile over a service lifetime. 5. DRAINAGE/TRANSMISSIVITY Ability of thick nonwoven geotextile whose 3-dimensional structure provides an avenue for flow of water through the plane of the geotextile. 6. SEPARATION The introduction of a flexible porous textile placed between dissimilar materials so that the integrity and functioning of both the materials can remain intact or be improved. 7. REINFORCEMENT Geotextile acts as a reinforcing element in a soil mass or in combination with the soil to produce a composite that has improved strength and deformation properties. 8. SEALING • The classic application of a geoxtile as a liquid barrier is paved road rehabilitation. • It minimizes vertical flow of water into the pavement structure. 13. DYNAMIC PUNCTURE  To measure the strength of geotextile to falling objects.  Stimulates placement of aggregate over geotextile during installation stage.  Expressed in mm. 15. APPARENT OPENING SIZE (AOS)  Reflects approximate largest opening dimension available through which the soil may pass.  Expressed in mm. 16. GRAB TENSILE STRENGTH AND ELONGATION  Measures tensile strength and elongation along the plane of the geotextile by loading it continually  Value of breaking load expressed in Newton and elongation at break in percent. 27. CONCLUSION  Geotextiles are an efficient effective and economic method of solving most of the geotechnical problems in roads.  The design engineer should be well aware of the possible problems and should use this relatively new tool for solving them.  For this he/she should understand properties and capabilities of the geotextile material.